Zeitgeist Addendum has been highly anticipated ever since the big internet success of Zeitgeist. I remember when I first saw it, roughly two years ago, when it just came out. I think I was the 50th person to watch it online after a friend of mine told me about it. Less than a year later it has been watched by millions of people worldwide and it got even released in selected theaters. It was probably the most popular “Conspiracy” documentary to this date. Reason for this is that it was very well done and Peter Joseph, the director, has a great talent to bring such topics on the screen and keeping the audience interested. The topics were very basic, however I thought it would be a great trigger and introduction for the people who are still asleep to these issues. So I had great hopes. I kept ordering DVD’s from the site and just gave it out to friends and random people. As time went by I realized that the wave didn’t catch as I thought it would. Lots of wishful thinking on my part. Just watching this film won’t do anything if it is not followed up with more research and action and many people who watched it didn’t seem “to get it”. The conditioning is strong! 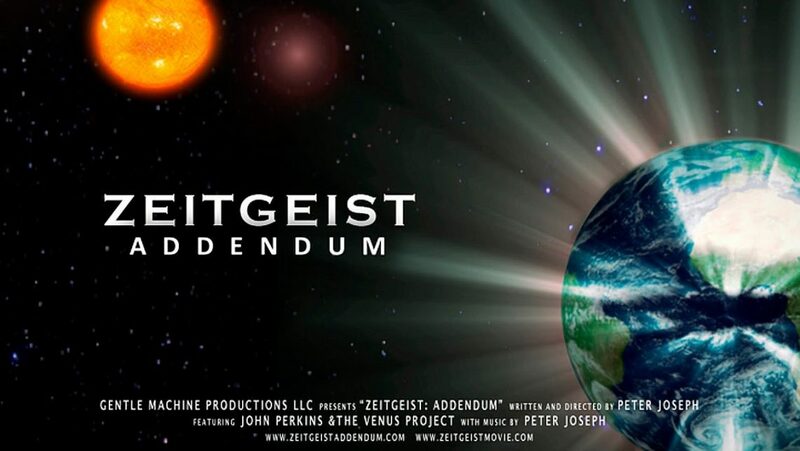 I have much respect for The Zeitgeist crew for pushing the film without just trying to cash in. Also much respect for Peter Joseph for keeping his ego out if this and let the film/message speak for itself. So on some level it did wake people up, but not on a critical mass scale. The first half I really enjoyed and thought it was well done. A good insight into the monetary system and the effects of economic terrorism. People need to become aware that they’re being screwed on a daily basis by the system Awareness of that is great and it was very well presented. However, the second half is a disappointment and I even had a hard time watching it to the end. Peter Joseph, the director and voice-over is coming to conclusions and solutions way too fast, leaving out a good chunk of some deeper implications. It very much takes a “New Age Utopia” turn, offering solutions without clearly having identified the main issue/problem, mainly the topic of Psychopathy and Ponerology. Not sure if he’s applying this advice to himself though.The biggest issue I have is this new age turn and slogan he uses as the “reason” for “uniting”, the assumption that “We are all One and we just need to recognize this” in typical “romantic” wishful thinking manner. For the pitfalls about the “we’re all one” issue, I refer again to the issue of Psychopathy. Yes we’re all one from a HIGHER perspective and separation is an “Illusion”, but applying this higher truth into our 3rd density experience is like saying gravity is an illusion. Great, so jump off a ten story building and see how this “illusion” will hurt. Further on, his view on Evolution and progress is quite limited. He has a very obvious bias to Religion. Not saying that dogmatic religion is all good, no, but the bible and other religious texts contain revealing alchemical and esoteric insights if one knows how to read the symbols and so he is throwing out the baby with the bath water. For example, the resurrection can be seen as a metaphor for the second birth that happens after man has stepped through the second threshold of esoteric conscious evolution. It is not a supernatural event. But it is in a sense of raising from the “dead”, meaning everyone is “dead” (asleep), attached to his false “I” of the personality before the second “birth”. When man realizes his real “I”, the true permanent Individuality, he awakens (re-birth) and starts to truly “live”, being in this world but not of it. However, it also doesn’t happen just by itself. Conscious work on the self is needed. At one point I felt it was like an advertising clip for the Venus Project, portraying the “leader” Jacque Fresco as the “all-knowing” wise man. It became even a bit comical in my eye, when he also uses him as an “expert” on religion and the bible. Too much emphasis on technology as the “savior” and the monetary system as the cause/root for the problems in the world. The fact that the film doesn’t go one bit into psychopathy and questioning “human nature” to begin with is a big let down. 2. Limited Darwinism view of evolution (he seems to push the idea that we evolved from apes….I already disliked that hint in the first Zeitgeist. Darwinism is actually just as part of social control as religious creationism), not fully analyzing what evolution truly means (mechanical vs. conscious). Also, not recognizing that there have been ancient civilizations who have been far superior in evolutionary terms than us. 3. Assumption that progress happens no matter what, without laying out what “progress” means to begin with, as if technological progress and evolution of consciousness are the same. 4. Leaving out huge parts that explain far more the state of the world than just basing it on the monetary system and “human nature”, without truly questioning “human nature” to begin with…..which goes back to point 1 and the topic of Psychopathy. In the end of it all, Peter Joseph even seem to go backwards, as if he forgot what the talked about in Zeitgeist 1. He says that the “tables are turning” and the system is crashing because a monetary system based on debt just can’t survive as it is. He says that they are trying to save the system through the bail out! What? No one is trying to save anything here. The crash and economic crisis are designed, purposely orchestrated. The bail out is a lie sold to the people. They are not trying to save anything. They know exactly what they are doing and the new system is already thought out and will replace the outdated system. No need to boycott anyone. The crash is happening no matter what and we will be living in a cash less world soon enough. Maybe Joseph should look into Icke’s concept Problem-Reaction-Solution to understand what is happening behind the curtain. Now, the stupefying thing is that he talked about the designed crash in the 20’s in Zeitgeist 1 and now this crash is happening because of bad politics/business/economy decisions? It makes no sense! It’s disappointing because Peter Joseph is a gifted film maker and has a good style of presentation. The first half is good, so people can become more aware of how they’re being screwed by the monetary system so to speak, however, the ending is misleading into some sort of utopia where people just can live peaceful together if there is right application of technology and abolishing of the monetary system. It would have been great if he would have researched more into psychopathy/ponerology, presenting these issues with his film making talents. 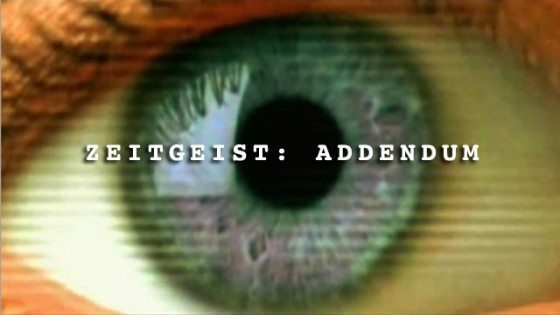 However, in this case Zeitgeist Addendum becomes more like a distraction and gives people false hopes. It’s one step forward and two steps backward. Z-Add is the basics of the basics, a good insight into the monetary system, but with conclusions and solutions that can be misleading and back fire. “The “Utopian Dream” presented by the Venus Project did not take into account psychopathy and characteropathy, including genetic and biological causes. Without this consideration, it is merely a matter of time before ponerization comes again. It becomes clearer by the day that a splitting is happening, not a unification. The only unification that will happen in this current 3D experience on earth is through global control, because there is NO spiritual unity. True Spiritual Unity can only happen if people see the world as it is, without wishful thinking and misplaced hope. Unconditional Love is just that: to see as is. With 6 billion people lost in the wilderness, waiting for a savior/leader (be it Obama, Jesus, ET’s, etc…), I don’t see that happening any times soon. In this corrupt state the world is in, unification is being forced upon based on lies for greater control. The “New Age” Religion with its pseudo teachings is part of this set-up. False prophets are everywhere as they feed off the credulity of the people. These are precious times to choose between the way “up” or “down”, Being or Non-Being, between truth and lies. Trying to offer solutions and an economy system that works “better” and “for all” without looking into deeper issues this world faces will eventually back fire. And that is the main blind spot of Zeitgeist Addendum. The road to hell is paved with good intentions. “With the approach of the era of the Holy Spirit, everything must be gradually brought to the light of day, nor only the secrets of the laboratory but the deepest meanings of esotericism. The same must happen with illusions, errors and lies, which must also be revealed so that they can later be rectified. The world is suffering from a lack of harmony which gets deeper on every plane, and this is a serious danger to the moral and spiritual recovery of humanity. It also involves a serious risk of failure in the last stage of this Time of transition that we are now entering, If this risk is not overcome, the Deluge of Fire awaits us. We will have to make an immense effort to ward off this fate, and we have very little time in which to do it. It is difficult, if not impossible, for an esoterically unevolved person to discern false prophets spontaneously. He will recognize them more easily by their “fruits,” by the observable results of their works, which serve as signs. “The great Sufi Shaykh Ibn al-‘Arabi explains that “imperfection” exists in Creation because “were there no imperfection, the perfection of existence would be imperfect.” From the point of view of Sheer Being, there is nothing but good. At our level of reality, the understanding that “nothing is real,” as has been promulgated by gurus and teachers down through history, is as useless as saying “gravity isn’t real.” Such considerations are useful only for expansion of perception. They are not useful for practical application since the energies of creation apparently transduce through several “levels” before they meet in the middle, so to say, in our reality. God creates the good and the evil, the ugly and the beautiful, the straight and the crooked, the moral and the immoral. Between these traits lie the manifold dangers of the path of the seeker of Truth. Such a statement ignores the fact that the statement “God is One” describes a reality that is a higher level from which our own “mixed being” manifests. The man who assumes that he can become like God at this level just by thinking it, ignores the facts of Being vs. Non-being which outrays from “God is One” at a level of existence that is clearly several levels above our own. Evil is REAL on its own level, and the task of man is to navigate the Cosmic Maze without being defiled by the Evil therein. This is the root of Free Will. Human beings are required to discern between good and evil – consciousness energy directors – at every stage of their existence in this reality. Because, in fact, they must understand that God is consciousness and God is matter. God is good, and God is evil. The Creation assumes all the different properties of the many “Names of God.” The Cosmos is full of Life-giving and Slaying, Forgiveness and Vengeance, Exaltation and Abasement, Guidance and Deception. To attempt to assume God’s point of view and “mix everything” at this level, results only in STAYING at this level. Therefore, human beings must always separate God’s point of view from their own point of view and the fact that all creation assumes the divine Names and Traits. Thus, the first Divine Command is BE! And that includes Being and Non-being instantaneously. Therefore, the second law is “follow Being or Non-being according to your choice and your inherent nature.” All creation is a result of the engendering command. So, in this respect, there is no Evil. But the second, prescriptive law determines to which “Face of God” one will return: Life or Death. On the whole, a capacity to cheat, to compete and to lie has proven to be a stupendously successful adaptation. Thus the idea that selection pressure could ever cause saintliness to spread in a society looks implausible in practice. It doesn’t seem feasible to out-compete genes which promote competitiveness. “Nice guys” get eaten or out-bred. Happy people who are unaware get eaten or out-bred. Happiness and niceness today is vanishingly rare, and the misery and suffering of those who are able to truly feel, who are empathic toward other human beings, who have a conscience, is all too common. In short, if psychopathy threatens the well-being of the group future, then it can be only be dealt with by refusing to allow the self to be dominated by it on an individual, personal basis. Preserving free will for the self in the practical sense, ultimately preserves free will for others. Protection of our own rights AS the rights of others, underwrites the free will position and potential for happiness of all. If mutant psychopaths pose a potential danger then true empathy, true ethics, true conscience, dictates using prophylactic therapy against psychopaths. It seems certain from the evidence that a positive transformation of human nature isn’t going to come about through a great spiritual awakening, socio-economic reforms, or a spontaneous desire among the peoples of the world to be nice to each other. But it’s quite possible that, in the long run, the psychopathic program of suffering will lose out because misery is not a stable strategy. In a state of increasing misery, victims will seek to escape it; and this seeking will ultimately lead them to inquire into the true state of their misery, and that may lead to a society of intelligent people who will have the collective capacity to do so. To allow oneself to be conned, or used by a psychopath is to effectively become part of his “hierarchy” of feeding. To believe the lies of the psychopath is to submit to his “bidding” (he bids you to believe a lie, and you acquiesce), and thus, to relinquish your free will. At best, we can only really penetrate to the level of the psychological reality, observed behavior that is discordant, or self-destructive. And we are thoroughly programmed to help by giving until it hurts, or trying to fix, or to make nice. All of these things, all of these accommodations of psychopathy, on just a practical level, can be seen to “select for psychopathy” in terms of the gene pool. And we see that the ultimate aim of the psychopath, as living representatives of the Universal forces of Entropy, of Non-Being, is to MASTER creative energy. To assimilate it to the self, to deprive others of it by inducing them to believe lies. All creation is a result of the engendering command. So, in this respect, there is no Evil. But the second, prescriptive law determines to which “Face of God” one will return: Life or Death. Do you observe the world based on truth, objectivity, as the Universe views itself? That brings life. Or, do you view the word based on lies, subjectivity, and do you seek to shut-out, control, or force the world to bend to your will? If so, you have chosen Death. Well done brother, piercing and proper, your grasp of GI, rather what is true, is deep and unrattled, much to be said of this. Flakes abound foolishness all around a pity. For a time I said Chopra etc. are needed for magnetic centre but then thought why the waste, further so many trapped in it. At the same time resistance will be what it is, we are to know a small few will get anywhere, the rest “food for the moon” I see in z that anything can be twisted by anyone, worse that it can be not even twisted and the uninformed will buy, and as we know there is much to sell. The simple question is who made this money? who made the idea of currency etc. That is the source, who is it that kills. How much more simple can it be. An outside system has always been inside. However this is the evolution, the machines are what and where they are, laughter is mostly all that can be called for for if dismay is felt then we have missed creation altogether. We are blessed in whatever way (karma etc.) that we have at least touched this. So commend yourself, and yet do not stop, for you will stop at resistance no different than the others and in that have done nothing. Great post, I had pretty much the same thoughts about the film as you did. That’s part of the reason I don’t like the “New Age.” Because non of it is actually new. It’s all been done and it’s all been asked before, and in my opinion, the ancients who wrote these texts actually knew what they were talking about. you need to watch Peter Josephs lectures.